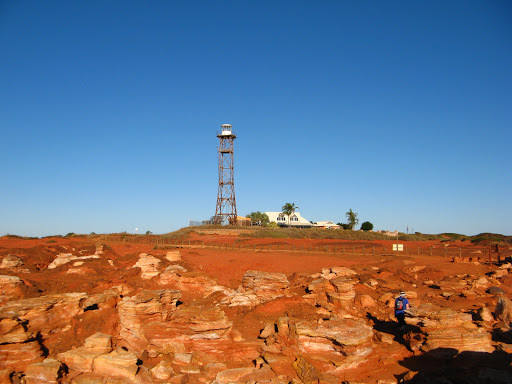 Left our very windy Doolena Gorge campsite and trudged the 170 km up to Port Hedland. While crossing the long, boring river plains I pondered the vexing question which has been asked countless times down the ages, "Does the Doppler effect apply to road trains"? Doppler Effect: "An increase (or decrease) in the frequency of [road trains] as the source [of road trains] and the observer move towards (or away from) each other". I was prompted to ask this question since we met around 15 huge 4 trailer road trains coming towards us but only one that over took us. 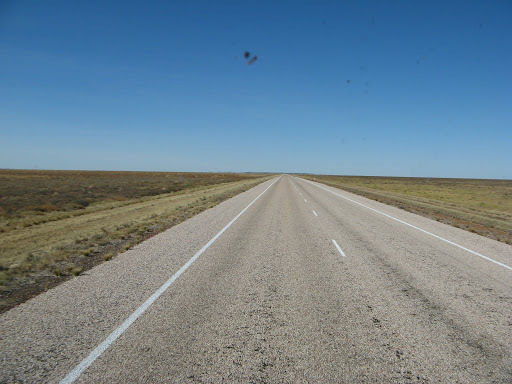 Now unless there is a huge mass of road trains piled up some where around Marble Bar, there has to be a scientific explanation. 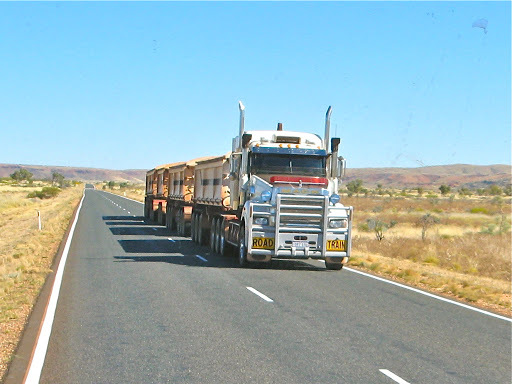 A typical Pilbara road train, 4 trailers and 86 wheels, all travelling at 100kph. Ponder this. 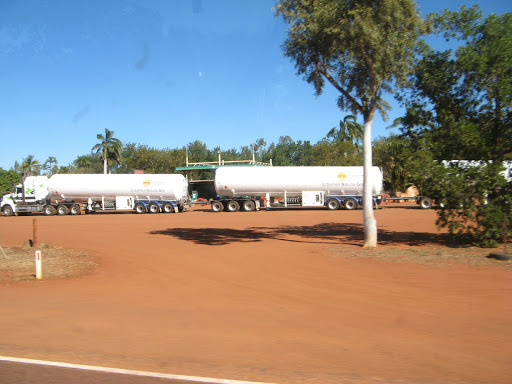 If we were not moving, there should be approximately the same number of road trains passing us in either direction. But according to the Doppler theory, if we move in one one direction, the number of road trains coming towards us should increase while the number going our way should decrease. This is exactly what happened today so the theory is confirmed, and the Doppler effect can indeed be applied to road trains. This lead me naturally to another thought (they were very wide river plains). Is there a road train speed barrier, (RTSB, like the speed of sound barrier), that can't easily be broken, and what might happen if you tried to? Well firstly you'd need a vehicle capable of considerably higher speeds than our Oka can attain, but assuming you had such a vehicle, as you approached the RTSB, you would see a significant increase in road trains approaching you, until they became a infinitely long blur of trailers, while you would be either completely devoid of road trains in your direction of travel, or if you were very unlucky, jammed up behind or in front of one. 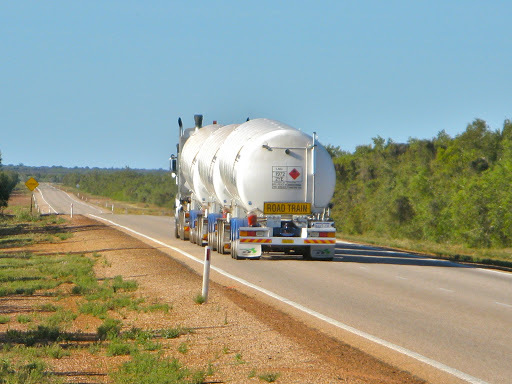 If you increased your speed still further, to something beyond that of a road train, there would be an almighty bang as you ran solidly into the back of one (you couldn't overtake it of course due to the continuous solid line of road trains coming towards you). So the bang that is heard when breaking the sound barrier, has a direct equivalence to the bang you would hear on breaking the road train speed barrier. Well I thought that was quite interesting anyway. And so we reach the scenic town of Port Hedland. 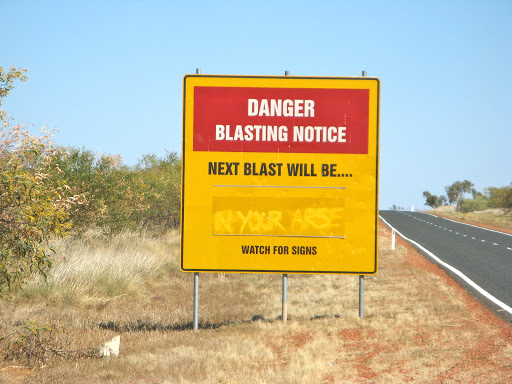 Always a hot, noisy and dusty place but not without it's humour. We spent the afternoon both giving money and receive gifts of groceries, gas, water and fuel, the greatest of which was gas. It took us an hour to track down the only place in PH which refills gas bottles. With 99% of Asia's gas supplies coming from the NW of Australia, you'd think they could spare a bit for us. 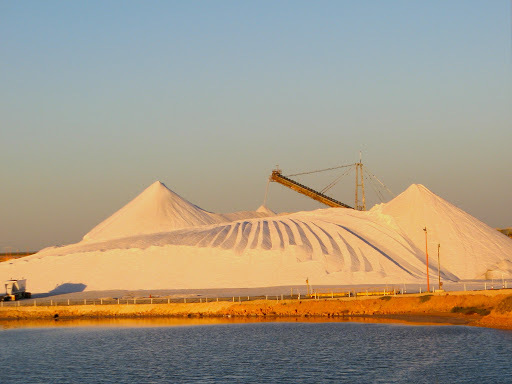 In a town built and almost 100% owned and run by BHP, it was interesting to find a Rio Tinto salt works flourishing, as surprising as a tulip in the desert. On the way out of town we had to stop at a rail crossing for one of their interminable ore trains. It filled the horizon, but what was more questionable was why are they sprinkling the bush with water? 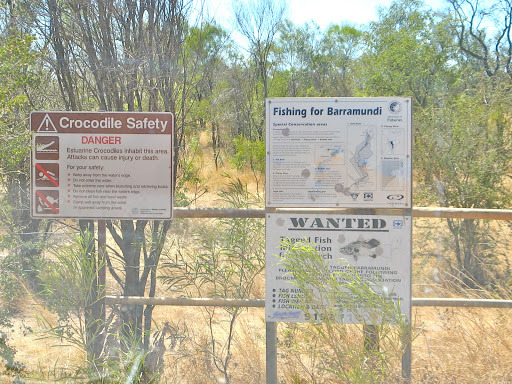 Hundreds of hectares of the foreground bushland is being watered. Why? We ran out of daylight on the way out of PH and had to find a small track about 1km of the main highway near the Tabba Tabba Hills. Not the best but quite adequate. On the way north we checked out the facilities at Pardoo Station, which claimed all sorts of wonderful amenities. However, the truth is rather different. A reasonable caravan park, but it was a 15km drive from the highway to their front door and then they only provide powered sites ($32/night) but worst of all the CP was 6-10 km away from the sea depending on which very corrugated track you took, and it was all mangroves and muddy creeks anyway, no seascapes. So we didn't even find it attractive enough to stop there for lunch. Our truck parking bay up the road for lunch up the road is much better and there is a 5 bar Telstra service here too. We had intended bypassing Cape Keraudren as it was fairly windy along the coast but with other stopping places being windy too, it seemed like the best plan after all. The Cape is a bit exposed but the wind had dropped and the seascapes are quite spectacular. 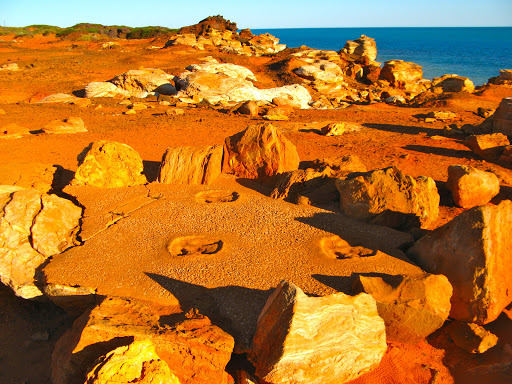 Stop Press: We are in phone range at Cape Keraudren and have been keeping up with all the Olympic news from the ABC. Yippee, day one of the Olympics and Australia is joint leader on the medal tally with 0 Gold, 0 Silver and 0 Bronze. And it has, but we (the royal we) have won gold in the swimming womens 100m relay. Well done girls. After doing some washing to take advantage of the drying wind, we walked along the beach to some of the most dangerously sharp rocks we're ever seen. Along the way the beach is covered in rocks, which are covered in shells. 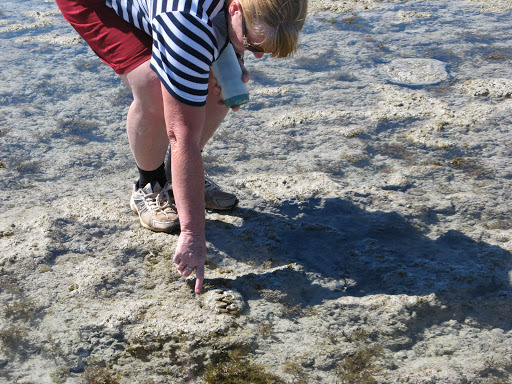 Tomorrow we return to 80 Mile Beach. And so we did, after a look around some of the Cape Keraudren beaches we missed out on previously. 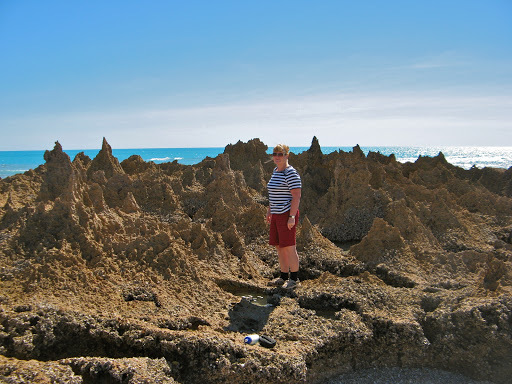 Then 100km up to 80 Mile Beach which never fails for astound it's sheer beauty and scenic splendour. 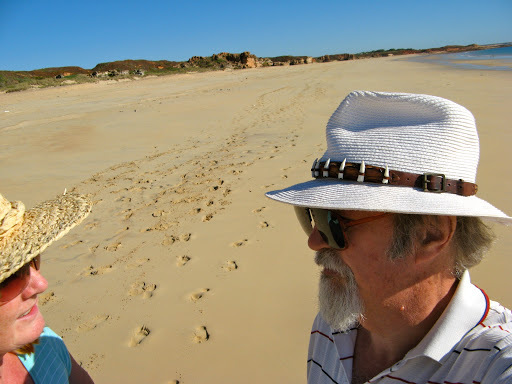 The sand on 80 Mile Beach is a little soft in places and we almost had a moment, but quick application of 4WD and all was fixed and no one noticed, not that there were many people to notice anyway. After lunch we refilled the water tanks from a beautiful sweet bore and headed north up the Coastal Highway (sic), since nowhere does the highway approach closer than 10-15km to the coast. If this was America, there would be a 4 lane highway running along the shore line with a bike lane for pony-tailed young persons to roller skate up and down, serving drinks. 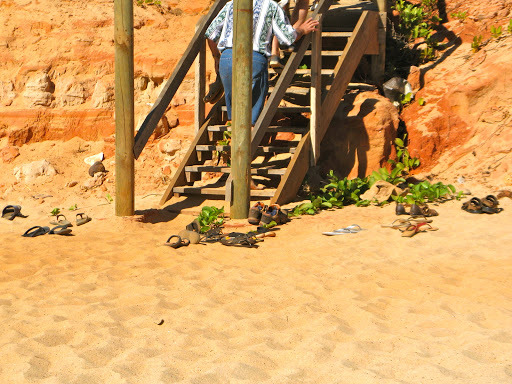 But here, cattle stations line the coast and very few of them allow travellers to access the beach across their land. 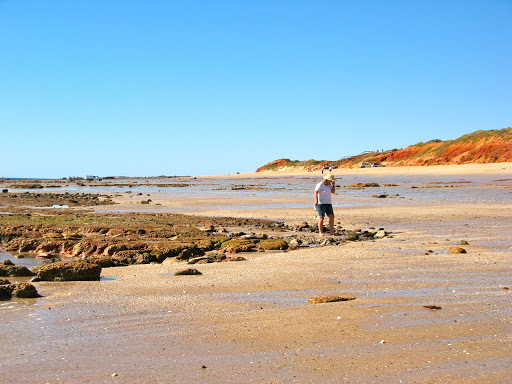 80 Mile Beach is an Australian treasure, warm, safe and no crocodiles but almost completely inaccessible. It will take an entrepreneur to cement this area on the itinerary of travelling Aussies. Just north of the 80 Mile Beach turn off, we passed the end of the Kidson Track which we emerged from 3 weeks ago, having completed a 3500km round trip down the coast of WA, across the inland and back to the warmer north. We just heard on the radio that the Kidson Track now has large mining rigs moving down it, after having been graded while we were on it. 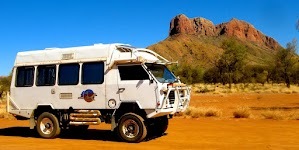 Good for the economy but bad for outback travellers. 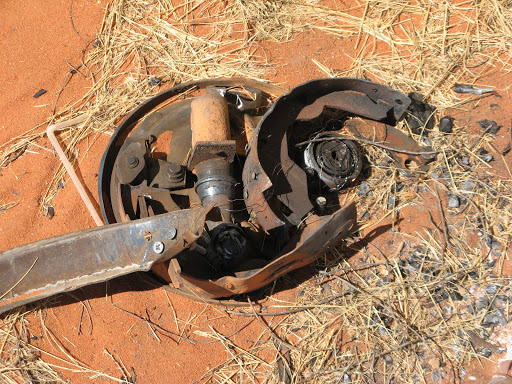 At Sandfire Roadhouse there was a huge potential bomb parked on the forecourt. Later this 74 wheeled monster roared passed us, we respectfully moved over. Further north we came across a caravan with 73 fewer wheels. It obviously had a major wheel bearing failure and the owners had gone on to locate spare parts and left a note pinned to the door imploring people to leave "their pride and joy" alone as they would be back to fix it. 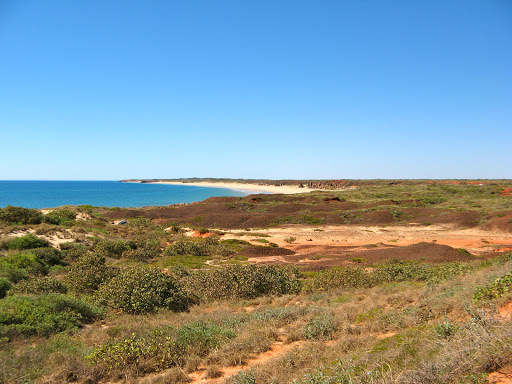 It was located about 300km from the nearest town on one of Australia's most remote highways, so that will be a tall order. Later we rediscovered a good camping area we first found in 2007, a former road workers camp just off an otherwise barren and very long highway. 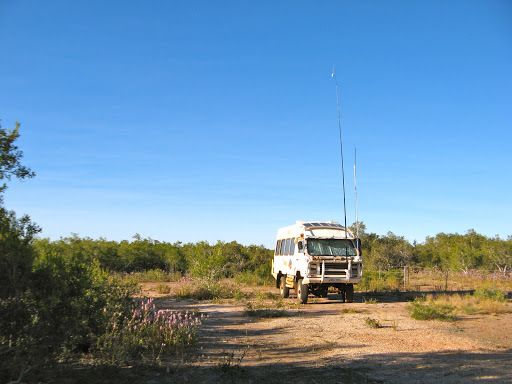 We had a look in Munro Springs Station Stay, a cattle station offering camping facilities. It certainly looked very green with sprinklers everywhere so would be a nice oasis on this otherwise barren highway. A km further on we stopped at Shamrock Gardens market garden store and bought a few items and tried some free samples of various pickles. Had a long chat with the lonely lady there. Apparently Shamrock Gardens used to be a part of Munro Springs but was split off some years ago. Staying for a couple of days at Barn Hill, a station stay cattle station but this one is on the coast with a beautiful clear blue sky. It was a stinging hot sun but fairly cool. Had to fix a collapsible chair which had collapsed. 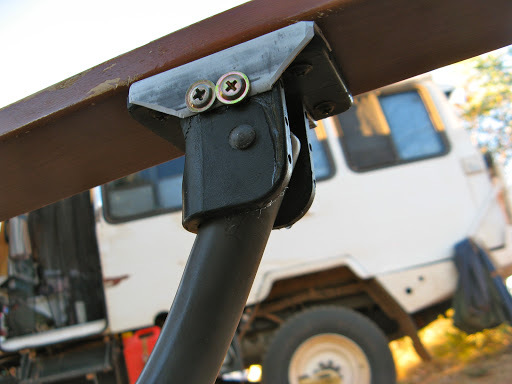 The arm bracket had broken. Drills, superglue, plastic angle and screws have repaired it successfully. Partly true. First we climbed the actual Barn Hill. 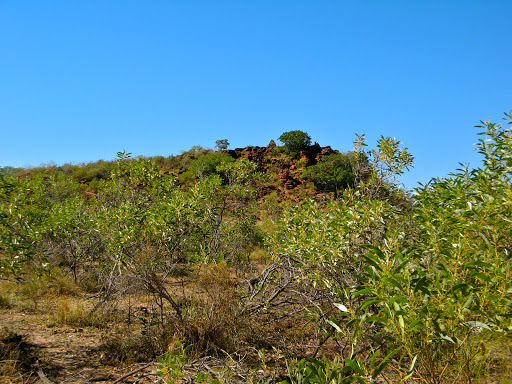 It's a fairly small rocky outcrop about 30m high just behind the campsite, one of the few hills around in this coastal sand plain country. 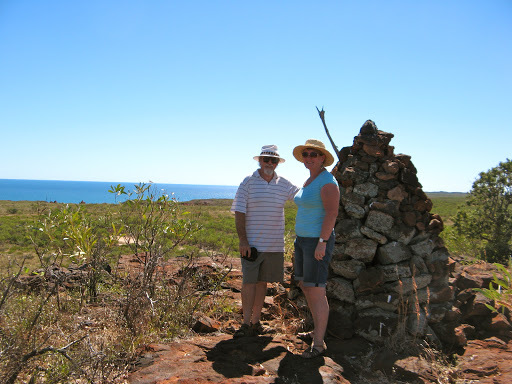 It's famous for the cairn on the top which was built by Alexander Forrest during one of his expeditions to the Kimberley in 1879, and people are urged, nay commanded, not to add or subtract rocks from the cairn to retain its original historical status. 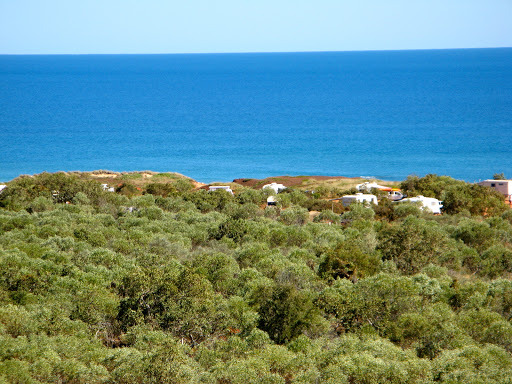 From the top excellent views may be had of the beach and camping ground area. After lunch, yes, we did then walk on the beach, but since it was low tide, the sea was miles away. You can barely see my arm holding the camera. Did some maintenance this morning while J did more washing (while we have unlimited water and sunshine). Topped up the gearbox and engine, greased the drive shafts and fixed the thermostat for the turbo timer which is falling apart. After lunch a walk on another beach, south this time. Apparently there's a mm of beach we haven't walked on yet. It's more rocky than the northern beach, just the place not to put a boat launching area, but that's exactly where it is. Heading north from Barn Hill we came to the junction of the Great Northern Highway (Highway 1) and the Broome Highway at Roebuck Plains. 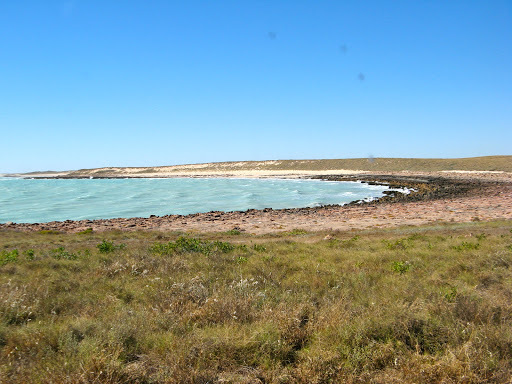 Broome is around 45km from Barn Hill as the emu flies across Roebuck Bay but 150km by road, which took all morning. 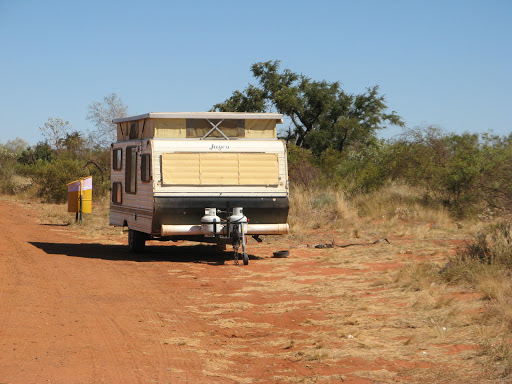 Since we knew all the camping areas in Broome would be chockers or illegal, we checked in at a new, all un-powered site, country-style caravan park, The Gateway, on the Broome road about 30km (25 mins) drive from the town. 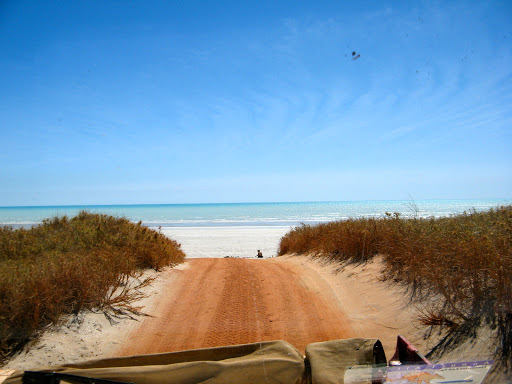 Now it doesn't matter how late we leave Broome we still have somewhere to stay. 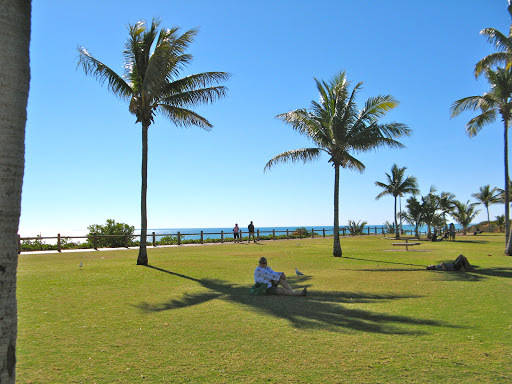 Broome is still very much the same as we remember from 5 years ago, except that the traffic is much heavier, there are new shopping centres and they've built a whole new and confusing road system. So it wasn't really the same at all. 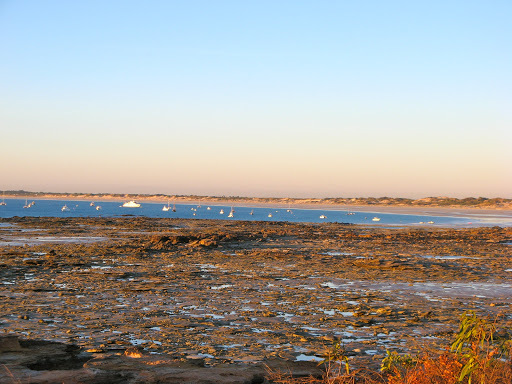 The beaches and the hot winter sunshine haven't changed though and after the usual supermarket thing, we headed down to Gantheaume Point along a still sandy gravel track to watch the sunset. 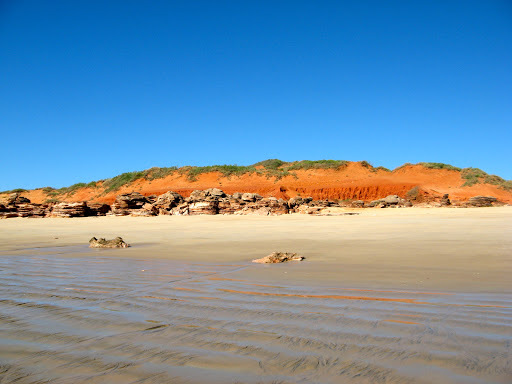 Strangely Gantheaume Point has to be one of Broome's most scenic attractions and yet it doesn't appear on any signposts. 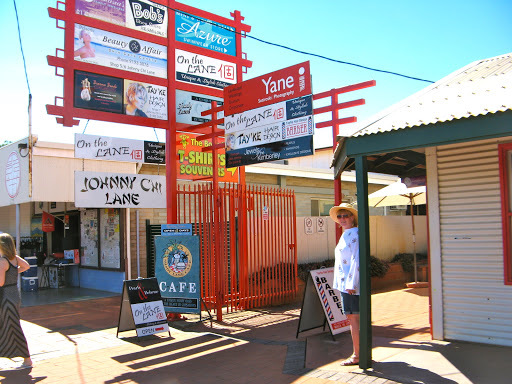 Maybe the lack of shops or anywhere to spend your money might have something to do with it, as from the signposts, you'd think that the only places you can go to from Broome town are Cable Beach or Derby. 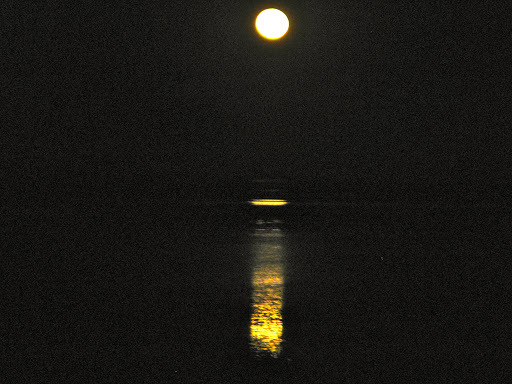 As it happens it was a day for the Staircase to the Moon showing on Town Beach and they celebrate by having an evening market and thus the removal of funds from the pockets of tourists. We had some Lumpia (Philipino Spring Rolls) and headed back to the CP, arriving after a late night out at around 8.30pm. 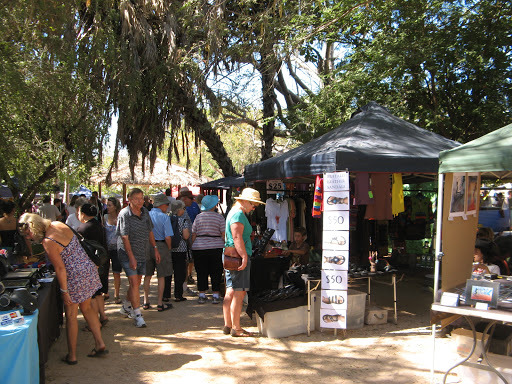 Back into Broome this morning for the weekly Courthouse Markets. These are a much bigger affair than the Town Beach markets but strangely the same stalls seem to be there. Why is it that all markets are full of stalls selling women's clothes, earrings, home made pickles and exotic smelling soap? Where are all the stalls selling stuff for blokes, like car parts, tools, electrical gadgets and books on making your own hand grenades? Nowhere to be seen. Fortunately, at a daytime market, micro-shorts and miniskirts are more visible and plentiful so I reluctantly accepted the lack of mens stalls. 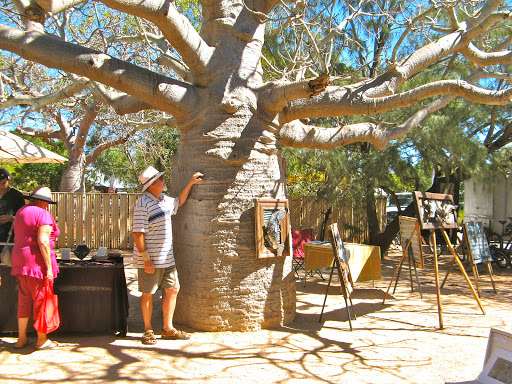 Me and a large boab tree, viewing a collection or art made from scrap metal. I could do that! As is usual, J bought some ear rings and a loose fitting white smock thing to keep the fierce sun off and then we left for lunch at the Echo Cafe. We could have gone to Subway or Maccas. 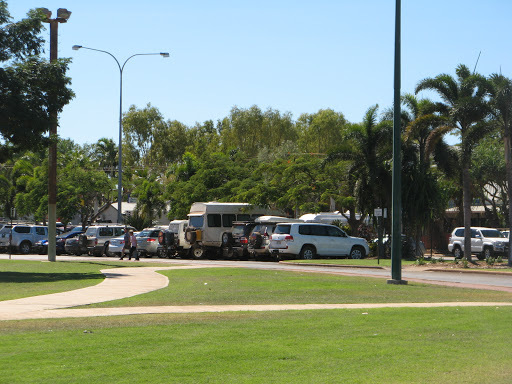 They're new, for a long time the Broome council refused permission for fast food outlets. J in her new white smock outside Johnny Chi lane. Only years later did we discover the motifs on her smock were actually marijuana plants. After a nice lunch we tracked down a gas bottle refilling place where, after paying and waiting 1/2 hour they decided they were out of gas, so they generously refunded my money and we went to Mitre 10 who did it straight away and it was cheaper anyway. I twanged my back doing up the cap on my fuel tank so I had to hobble about for the rest of the day, learning how to curtsy to pick things up from the ground. I had to hobble about for the rest of the day, learning how to curtsy to pick things up from the ground. 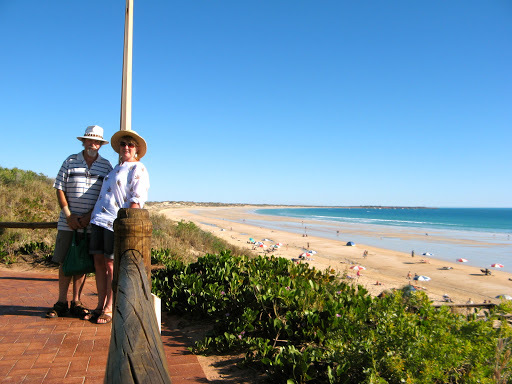 Using the aforementioned signposts, we went up to Cable Beach and walked around in the sea watching the international jet setters wallowing about or absorbing the ultraviolet. Mostly they seemed to be French with a few Germans. 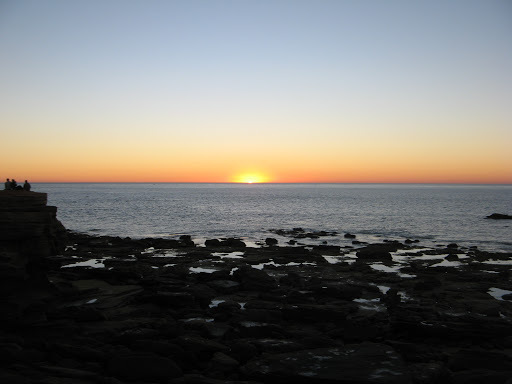 Having seen sunsets at Cable Beach a thousand times, (+- a few) we went back down to Gantheaume Point where at least there are rocks to break up the horizon. 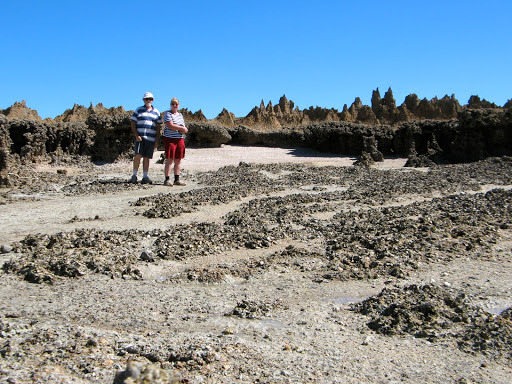 We've done Broome quite enough for this year so we headed east towards Derby. On the way J noticed that our small stone chip has spread to become a large crack across 1/3 of our windscreen. So it will become a $400 insurance claim after all. Around lunchtime (ie anytime between 10am and midday) we pulled on to a track that Dave told us about towards Langey Crossing on the Fitzroy River. 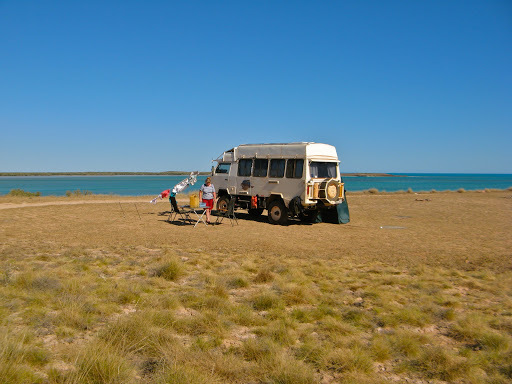 There are pretty good camping areas alongside the Fitzroy with several people trying their luck with the Baramindi. It's a crocodile river so we are camped on a rocky bank way above the river, just in case. Our campsite along side the Fitzroy River. There's crocs and Baramundi in there. Although it's early in the day to set up camp, my back locks up if I sit for too long and this is a very nice shady place, a warm 33º, with no flies and a cool breeze blowing. And a phone service too. Doesn’t get any better than this. The calm Fitzroy River though our Oka window. In the wet season we would be under a raging torrent. If my back problem doesn't clear up soon, I'll be tempted to undertake some more home surgery with my Swiss Army knife to remove a couple of vertebrae. 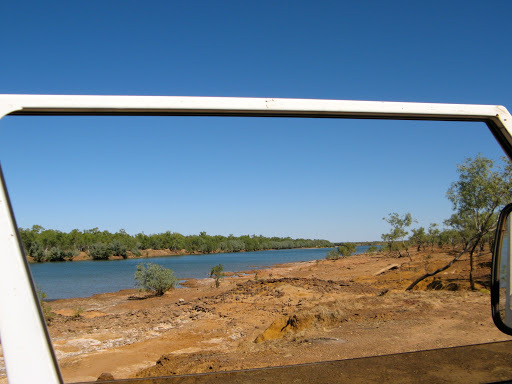 Langie Crossing on the Fitzroy River. An excellent camping area above a very picturesque river, quiet and docile now in the dry season but judging by the angle of the paperbarks on the far bank, a raging torrent in the wet..
We watched fisherpersons in boats casting nets for bait fish or trolling along waiting for the big bara to bite or just sitting by the river bank keeping a watch out for crocs which inhabit this mildly tidal river. There were plenty of birds to watch for including a Jabiru Stork (now boringly called a Black Necked Stork), herons, cormorants and bee-eaters. 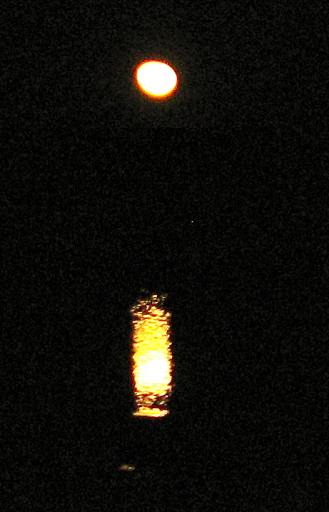 After dark, a full moon provided a "staircase to the moon" over the Fiztroy River and fish were spawning, sploshing about in the shallows, the urgency of which increased if you shone a torch on the water, simulating a second or more powerful moon, if you will. I would have happily stayed there another day but the delights of Derby were pulling us away. 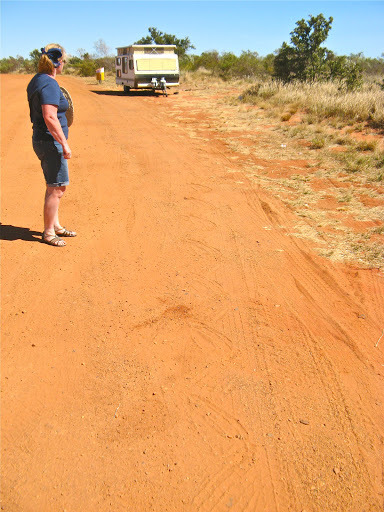 Continue our trek here, from Derby to Timber Creek via the Gibb River Road, Wyndham and Kununurra.